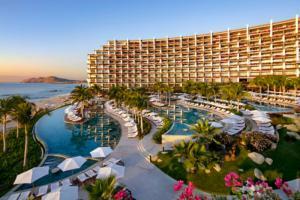 This luxury Los Cabos resort is located between Cabo San Lucas and San Jose del Cabo. It offers the next generation of all-inclusive amenities and facilities, with 307 suites and ocean views. Grand Velas Los Cabos All-Inclusive resort features a wide variety of gourmet restaurants, coffee shop, mezcal and tequila tasting room, wine-based features inspired by the proximity of Mexico's wine region, Convention Center, Spa with hydrotherapy facilities, ocean view Fitness Center with personal trainers and exercise programs, and three oceanfront pools. Families will enjoy recreational activities, as well as a modern Teens' Club and Kids' Club with arts, crafts, games and more. Located on the corridor extended from Los Cabos to San Jose del Cabo, and 35 minutes away from International Airport.